Disclaimer: The author and editors are not financial professionals and nothing in the following should be construed as investment advice. 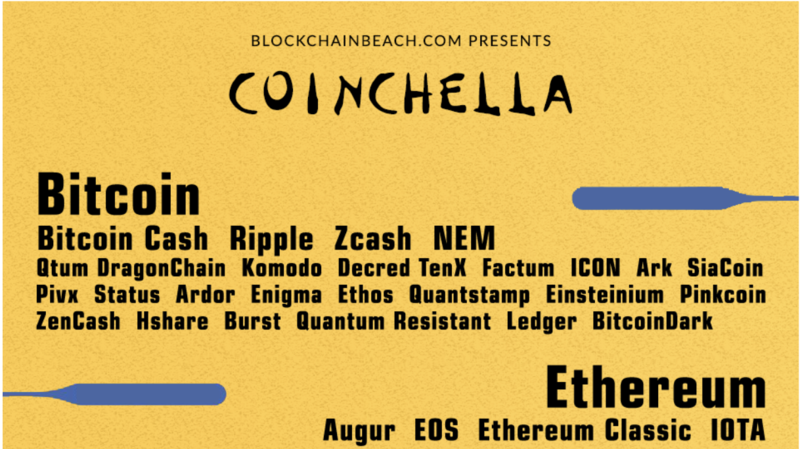 Also, Coinchella is not yet a scheduled event, although we hope to be celebrating it in spirit all year long! An Exchange Traded Fund is a security that allows you to invest in a index, a commodity, bonds, or a basket of assets. Popular index funds include ones that allows people to invest in the Dow Jones Industrial Average and the S&P 500. This allows investors to hold these without having to buy each component individually (the S&P 500 has, as you may have guessed, 500 stocks that comprise it). In March of 2017, the Winkelvoss Twins (yes, the ones from the Facebook movie) applied for and were denied certification for their Bitcoin Trust ETF. This ETF would allow for investors to buy a financial instrument that mirrors the price of Bitcoin, but they would not have to purchase the actual Bitcoins and be responsible for the security or be holden to the rules of an exchange, such as Coinbase. This is the first time in recent memory that Wall Street (Venture Capital, Private Equity, etc) were not the first to take advantage of a new investment opportunity. The laws are in place to protect the everyday investor, but also make it almost impossible for non-accredited investors to put early money into startups, like Airbnb. These types of investments do hold significant risk, as only about 1% of start up companies succeed, but for accreditation you must have over $1M in assets or have earned $200K+ for two years in a row. In December of 2017, the Securities and Exchange Commission (SEC) halted two ICOs. The first for “guaranteeing” a 1,354% profit in the first month — an illegal marketing tactic. The second bust was for a company creating a Digital Token/Coin that would not have been immediately usable for the service they were marketing it for. We will see much more of this for blatant violations of current securities law, but it’s the grey areas that will start to seem more black and white in 2018. However, it will not be the SEC making the determinations in these grey areas, it will initially be the courts. Class Action Lawsuits will be brought against companies who have failed to deliver on the promises they made during their ICO processes. A few landmark cases will dictate the law and set the precedent moving forward. That in conjunction with legislation from Congress will give future ICOs a roadmap for success (and show them the pitfalls to avoid!). Most, especially those in the United States, use Coinbase as the easy way to buy Bitcoin, Ethereum, and Litecoin using USD$ from their bank account or credit/debit card. However, the way they handled their recent launch of Bitcoin Cash left many disappointed and potentially put a regulatory bullseye on their back. Launching Bitcoin Cash (BCH) trading in mid-December (prior to their previously announced date) caused extreme volatility in the markets. Also, the run up in BCH price in the hours leading to the announcement stoked questions of insider trading by Coinbase employees. Financial Industry Regulatory Authority (FINRA)-certified broker dealers will be the first to use the platform to trade securities and security tokens (to learn more about tZERO, read about the Overstock tZero ICO). This paves the way for tZERO launching a retail exchange in the second half of 2018. EOS is a Blockchain platform that is half based out of our own Blockchain Beach area and half in Northern Virginia. In early December of 2017, EOS launched their Testnet, which allows developers to begin building applications for this new platform (apply here). When the Mainnet of the Platform launches this summer, it is supposed to be able to process many more multiples of transactions than Ethereum (which was recently clogged by one Digital Cat game). Ethereum currently operates under a proof-of-work protocol for keeping its networks in sync. With the forthcoming Casper protocol, Ethereum will be differentiated by moving from a “Proof of Work” to a “Proof of Stake” system for long-term sustainable scaling. This update could be a game changer for transaction times. This will be an exciting year!